Dr. Timothy Jennings is board certified in Family Medicine and has been in practice for over 21 years. He is one of the country’s top ranked doctors. Based on an in-depth analysis of Dr. Jennings’ network, credentials and experience, he has been found to be in the top 20% of doctors nationwide by Better Doctors. As a family practitioner, Dr. Jennings is often the first doctor a patient sees for assessment of potential health problems and the management of chronic conditions. Dr. Jennings earned his medical degree at Kirksville College of Osteopathic Medicine and completed his residency at Normandy Hospital and Deaconess Hospital West (now Des Peres Hospital) in St. Louis, Missouri. Dr. Jennings is a member of the American Osteopathic Association, the Missouri Association of Osteopathic Physicians and Surgeons, the Missouri Association of Osteopathic Family Physicians, and the Saint Louis Association of Osteopathic Physicians and Surgeons. He is the chairman of the MAOPS Membership Committee as well as a member of the MAOPS Physicians Health Committee and the MAOPS Legislative Committee. Dr. Jennings is a past president of MAOPS. Dr. Jennings is a board member of Primaris. Primaris has played an integral role in improving healthcare for Missouri’s one million Medicare beneficiaries and beyond by providing a team of experts in assisting providers with quality improvement, medical case review, electronic data reporting and health information technology. Dr. Jennings has a large, successful practice with over 4,300 patients in his database. Rankings from patients per online websites rate Dr. Jennings 5 stars out of a possible 5 star rating. Between Dr. Jennings and his partners, they have well over 10,000 patients. Dr. Anthony Margherita, is a Principal Investigator with Clinical Research Professionals. 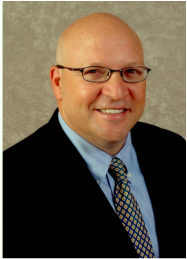 He has been in private practice since 2003 as the Medical Director of West County Spine & Sports Medicine. Dr. Margherita is board-certified in physiatry (physical medicine & rehabilitation) and by the American Board of Electrodiagnostic Medicine specializing in non-operative spine care and sports medicine. Dr. Margherita has over 20 years of experience in evaluating disorders of nerve and muscle and has done over 20,000 procedures. He has extensive research experience as a Principal Investigator in over 85 trials. His trial experience includes acute and chronic pain treatment, osteoarthritis, pain medication, narcotic pain medication, diabetic peripheral neuropathy, bursitis, migraine headaches, restless leg syndrome, Parkinson’s disease, postherpetic neuralgia, muscle strain, chronic low back pain, multiple sclerosis, tendonitis, and gout. 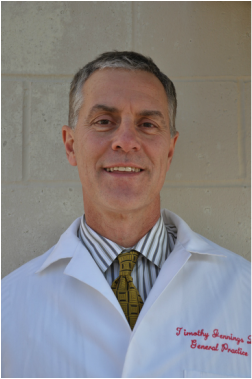 Dr. Margherita earned his medical degree from Georgetown University’s School of Medicine in Washington, D.C. in 1985 and completed his residency in Physical Medicine and Rehabilitation at the U.C. Davis Medical Center in 1989. From 1989 through 1997, Dr. Margherita served on the faculty at the University of Washington in Seattle before moving to St. Louis to serve as a faculty member at Washington University School of Medicine in 1997. He lectures locally, regionally, and at the national level on spine, sports, and musculoskeletal medicine and pain mechanisms. He has been a study section panelist for the National Institute of Health, a research review panelist for the National Institute for Disability and Rehabilitation Research, and is currently serving as an international advisory editor for the International Encyclopedia of Disability. Because of his outstanding clinical skills and expertise, Dr. Margherita has been honored as being among the “Best Doctors in America” for nearly 15 years. He also serves as the Medical Director for the Go! Saint Louis Marathon and as a consultant for Major League Baseball. Dr. Siddharth Kaul has been practicing medicine for over 17 years and is board certified in Neurology. He specializes in migraines, epilepsy, myasthenia gravis and Parkinson’s disease. Dr. Kaul’s online patient satisfaction rating is five stars out of five stars. He attended medical school at A.C.P.M. Medical College in India and completed his residency training at Southern Illinois University School of Medicine, Department of Neurology. He has a PhD in Neuroscience and has conducted extensive research for seven years in the field of Parkinson’s disease and movement disorders. His experience also includes treating stroke, neuropathy, epilepsy, infectious meningitis and pediatric neurology. He is highly proficient in performing electromyography (EMG) and reading electroencephalogram (EEG) tracings. Dr. Kaul is a member of the American Headache Society, Medecins Sans Frontieres (MSF)/Doctors Without Borders, The Michael J. Fox Foundation for Parkinson’s Research and the American Academy of Neurology. He speaks proficiently in the languages of English, Hindi and Kashmiri. Dr. Michael Spezia is board certified in Family Medicine and Orthopedic Surgery and has been in practice for over 30 years. His large, established practice performs specialized procedures including allergen immunotherapy, allergy testing, arthrocentesis, cardiac stress testing, hearing evaluations, psychological and neuropsychological testing. Dr. Spezia is known for his dedication to his patients, many from generational families as well as the medical field. Dr. Spezia earned his medical degree from Kansas City University College of Osteopathic Medicine and completed his residency at Normandy Hospital (now Des Peres Hospital) in St. Louis, Missouri. He is currently a preceptorship trainer for third and fourth year medical students. Dr. Spezia is the Medical Director for the Magdala House Foundation and works with the American College of Contemporary Laser Surgeons. He is a member of the American Osteopathic Association, Missouri Association of Osteopathic General Practitioners, Missouri Association of Osteopathic Physicians and Surgeons, and The American College of Osteopathic General Practitioners. 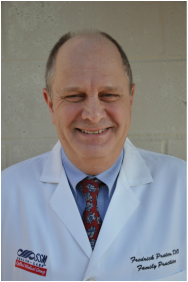 Dr. Fredric Prater is board certified in Family Medicine and has been in practice for over 29 years. He completed his residency at University General Hospital in Seminole, Florida. He earned his medical degree at Kansas City College of Osteopathy. Dr. Prater is a member of the American Osteopathic Association, the Missouri Association of Osteopathic Physicians and Surgeons and the American College of Osteopathic Family Physicians. He is ranked 5 out of 5 stars on the patient online review systems. Dr. Prater’s patient database numbers 3,500+ between the ages of 18 and 65 years. The practice he is a member of has a base of over 10,000 among the physicians. Dr. Robyn Haithcock is board certified in Internal Medicine and Gastroenterology. Dr. Haithcock is an Associate Professor at Kirksville College of Osteopathic Medicine. His practice as a gastroenterologist specializes in Diagnostic and Therapeutic Endoscopy and ERCP, Manometry, Laser, Laparoscopy and Cognitive Gastroenterology. Dr. Haithcock has participated in clinical research for Interferon and the F.A.S.T clinical trial as well as a number of retrospective data collection trials. Dr. Haithcock earned his medical degree from Oklahoma State University College of Osteopathic Medicine. His residency and internship was performed at Michigan State University, Detroit Osteopathic Hospital in Highland Park, Michigan. A gastroenterology clinical fellowship was at Oakland General Hospital in Detroit, Michigan. He is a Fellow in the American College of Osteopathic Internists. He is a member of the American Society Gastrointestinal Endoscopy, the American College of Gastroenterology, and a member Fellow at the American College of Osteopathic Physicians and Surgeons. Dr. Steve Fern is board certified in Internal Medicine and Gastroenterology. He is a National Board of Osteopathic Medical Examiners Diplomat and has been a Fellow of the American College of Osteopathic Internist since 2000. His professional memberships include the American Osteopathic Association, the American College of Osteopathic Internists, the Missouri Association of Osteopathic Physicians and Surgeons, the American College of Gastroenterology, the American Society of Gastrointestinal Endoscopy, and the American Association for the Study of Liver Disease. He is the President of the Saint Louis Capsule Endoscopy Club. Dr. Fern did his undergraduate work at the University of Dayton and is a graduate of the University of the New England College of Osteopathic Medicine. Dr. Fern is active in the teaching of programs of several medical schools and has lectured extensively on several GI topics locally, nationally, and abroad. 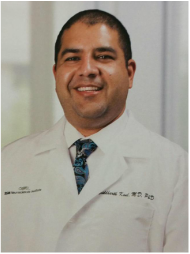 He is passionate about teaching health care providers about colon cancer, colon cancer screening, performance of a quality colonoscopy, as well as, wireless capsule endoscopy. Dr. Fern cares for adults with gastrointestinal disorders with an emphasis on colon cancer screening, Gastro Esophageal Reflux Disease (GERD), including Barrett's esophagus, and the care and treatments of patients with inflammatory bowel disease, including ulcerative colitis and Crohn's disease. His special interest include liver disease (including the treatment of patients with Hepatitis C), and esophageal motility disorders. He has expertise in wireless capsule endoscopy, and the SmartPill GI motility testing. ﻿Dr. Melvin Saltzman is board certified in Internal Medicine and Gastroenterology. He is committed to excellence and is well respected in the medical community, serving as the Chairman of Nutritional Support for 30 years at Des Peres Hospital and a clinical faculty member at medical schools since 1988. He has been in attendance at over 100 scientific meetings. Dr. Saltzman has been a requested scientific lecturer with 20 presentations and has co-authored seven literary articles. He has done research as a fellow at Yale and has participated in multiple retrospective data studies. He owns a medical practice that specializes in digestive diseases, clinical nutrition, and hepatology. Dr. Saltzman received his medical degree from Michigan State University followed by a rotating internship and residency in internal medicine at Zieger-Botsford Osteopathic Hospital in Detroit. His clinical fellowship in gastroenterology was at Yale University School of Medicine. He is a Fellow in the American College of Osteopathic Internists. He has memberships in the American Osteopathic Association, the American College of Osteopathic Internists, the American Society of Parenteral/Enteral Nutrition, the Missouri Association of Osteopathic Physicians/Surgeons, and the St. Louis Association of Osteopathic Physicians/Surgeons, the American College of Gastroenterology, the American Society of Gastrointestinal Endoscopy, and the American Gastroenterological Association.